Stay at the Tundra Lodge, situated outside Churchill, Manitoba on the vast expanse of the subarctic tundra of Northern Canada. 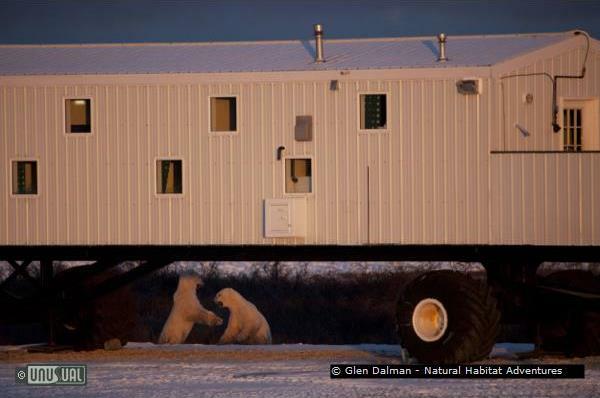 From your own private cabin window or the open-air observation platforms, you have constant proximity to polar bears in the area around the clock. 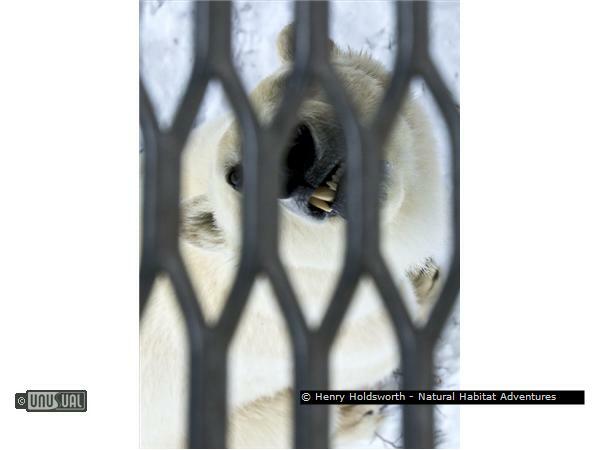 As evening falls, remain in the domain of the polar bear to experience sunset across the snow and ice. Safe inside your custom lodge, you'll enjoy surprising comfort, considering our environs. Note: this is a 7-8 Day Package Tour only offered in October and November !! 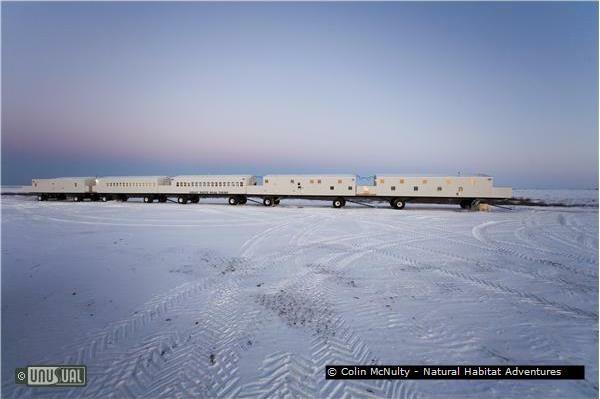 This custom “train” of connected bedrooms, dining room and lounge car is built on wheels, allowing it to be stationed for optimal bear viewing each season. There’s no more thorough immersion in the King of the Arctic's realm than on this most unique of northern adventures! 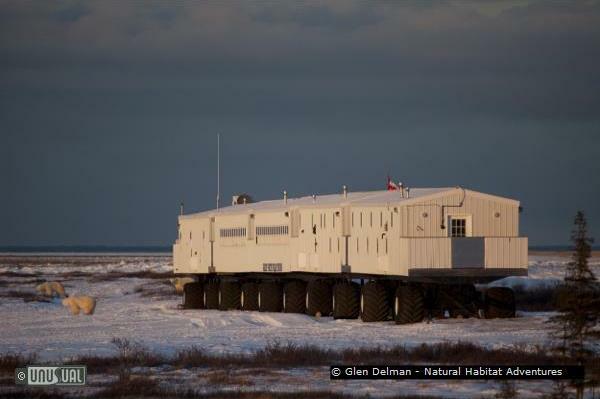 Provided by Natural Habitat Adventures, The Tundra Lodge, is located on the subarctic tundra outside the small Canadian frontier town of Churchill, Manitoba. 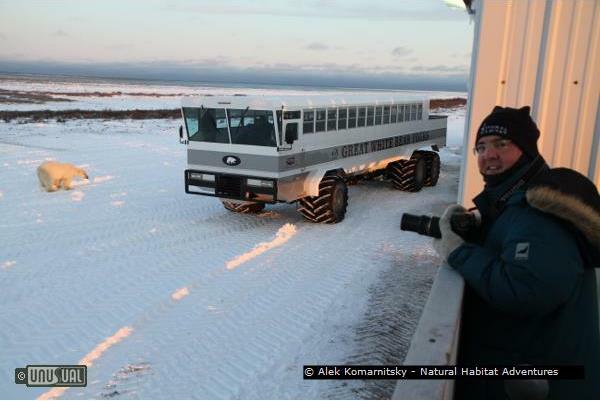 This custom rolling hotel is placed in an area of high polar bear density at the beginning of each polar bear season, which runs from October through November. The lodge has 32 rooms. Each room is a single compartment similar to sleeping quarters on a train with either an upper or lower berth. 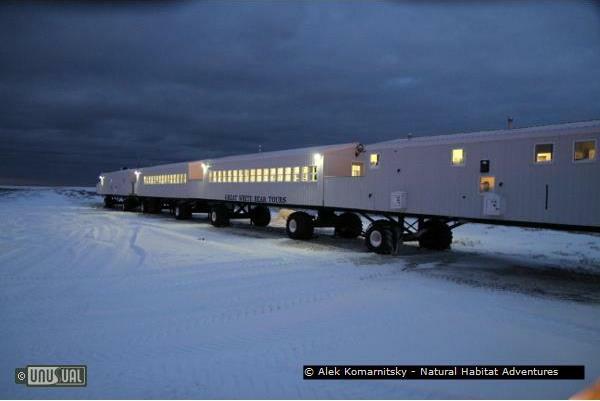 With six shared toilets and four showers, as well as a lounge area for viewing bears and a dining car with sliding windows for viewing and photography, the Tundra Lodge offers an authentic and personalized Arctic wilderness experience without sacrificing comfort. Raised outdoor viewing platforms also facilitate excellent polar bear viewing and photography opportunities, as well as aurora-watching when the northern lights are visible. 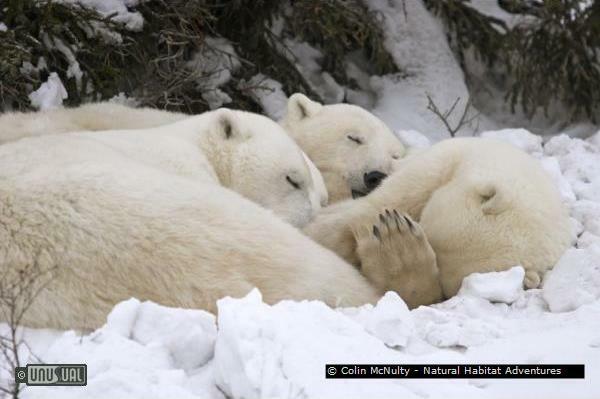 There's no opportunity anywhere else on the planet that affords the chance to be in prime polar bear habitat around the clock! 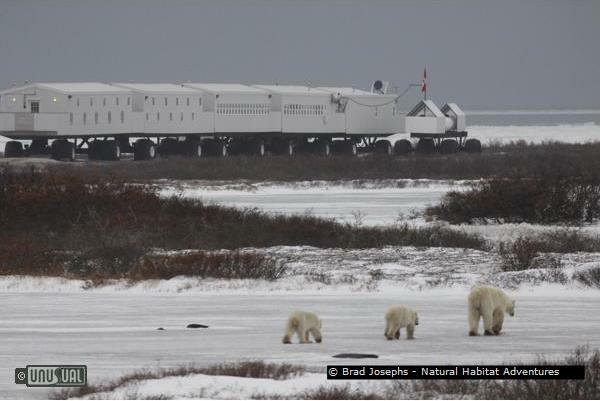 Stay at one of the world’s most unique accommodations: a mobile hotel designed for polar bear observation, placed each season directly in the bears’ habitat! 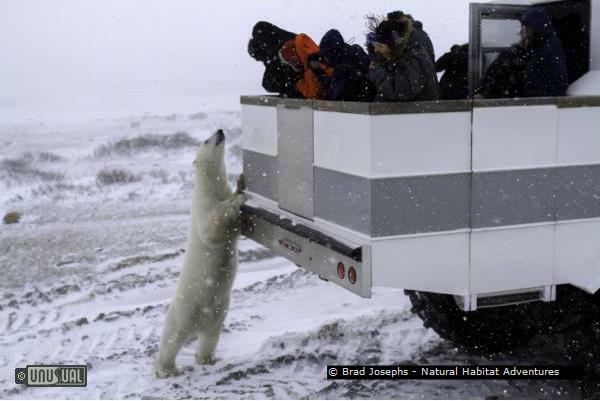 Stay at our exclusive Tundra Lodge, known as the best spot in the world for photographing polar bears! Arrive in Winnipeg, once a fur-trading post and boomtown for the Canadian Pacific Railway, today Manitoba’s cultural and commercial capital at the eastern edge of Canada’s vast prairies. Transfer to the historic Fort Garry Hotel, grande dame of Winnipeg hospitality and one of the city’s most prestigious landmarks. Meet your Expedition Leader at an orientation dinner this evening. Fly to Churchill and transfer to the Tundra Lodge by Polar Rover, watching for Arctic wildlife against the vast white landscape along the way. A presentation on polar bears by our Expedition Leader provides an enlightening introduction to our unique northern adventure. We enjoy dinner together prepared by our professional chef, who resides at the lodge throughout the season. 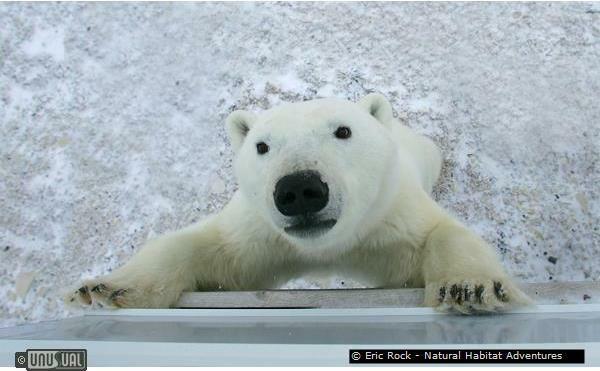 Don’t be surprised, though, if our meal is interrupted by a mad dash to the windows to watch a polar bear lumbering across the snow around the lodge. 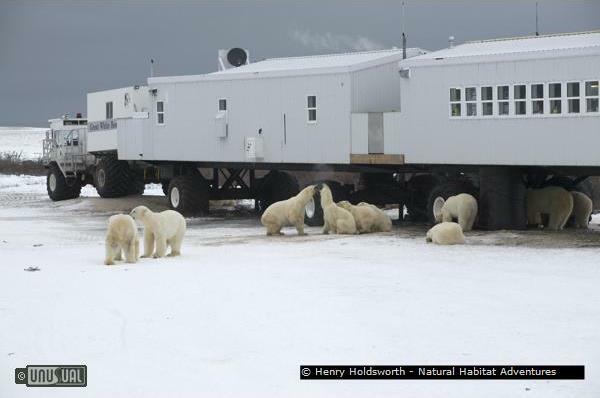 The Tundra Lodge is strategically positioned at the beginning of each season in a spot that attracts the greatest number of polar bears in the Churchill area! Inquisitive bears often approach the lodge, which features rows of windows and fenced observation decks to accommodate our own curiosity. We find Ursus maritimus even more majestic up close than we could have imagined. 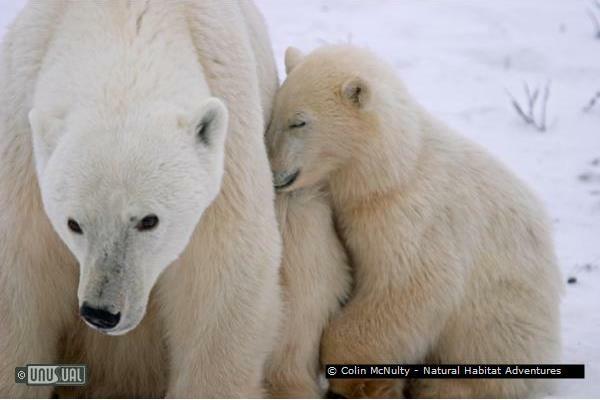 Yet these giant bears, the largest land carnivores in the world, are charming and whimsical, too, and we are aware of what a rare treasure it is to see them in their wild habitat. As we watch them interact, we're delighted by their antics and rugged beauty. 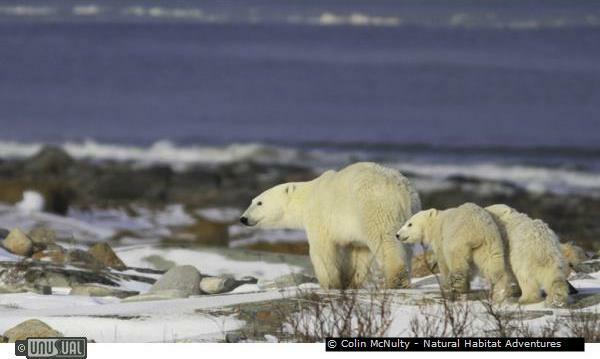 We may see mothers protecting and teaching their cubs, young males play-fighting, or massive adults patrolling the shore as they wait for the bay to freeze. This morning we board our Polar Rover, leaving the ice-bound coastline of Hudson Bay in the distance as we make our way back to Churchill. 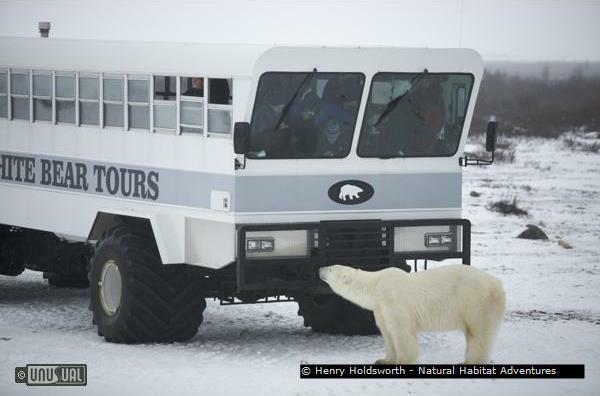 Depending on flight schedules, there may be time for some last-minute exploration of this subarctic frontier community, originally a Northwest Company fur-trading post, with a chance to pick up local handicrafts and souvenirs or take part in an optional helicopter tour over the tundra. We enjoy a farewell lunch in Churchill before flying back to Winnipeg where we have a final reception before our adventure concludes. After breakfast, we transfer to the airport for flights home. This is my idea of a Very special holiday which I would love but unfortunately is beyond my means so I will keep trying the lottery and may join you one day . Thanks for the insight , quite wonderful . Regards , Bill .